I was at the Monday Shop, on Monday funnily, where you can pick up surplus organic vegetables that have been on market stalls or veg vans around Oxford over the weekend. 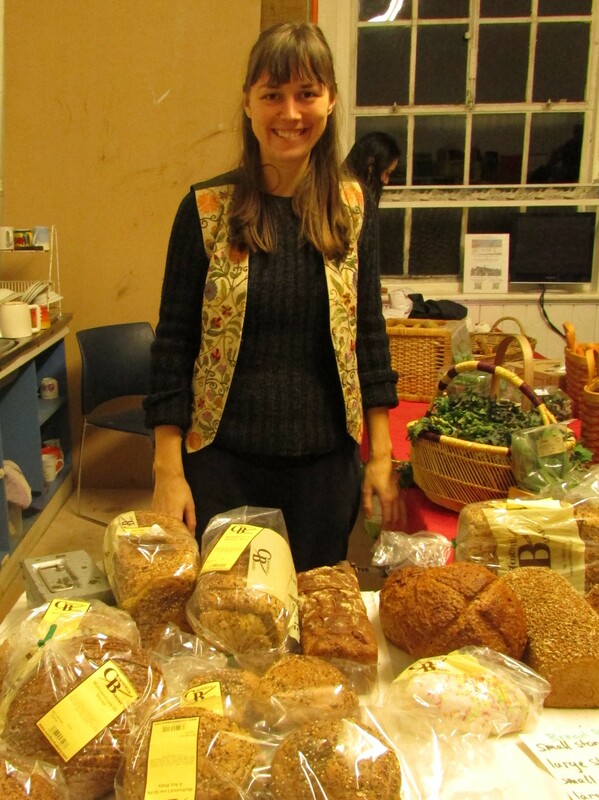 The shop runs by donation only, to help reduce food waste in Oxford. It’s a clever way of getting slightly tired looking vegetables to people that want buy organic and create healthy meals on a budget. I couldn’t wait to get down and see what was on offer. The shop runs every Monday from upstairs at the Cowley Road Community Centre from 4-8pm. Cornflower Bakery in Wheatley and Sesi also showcase their products. I arrived at around 6.15pm to many friendly faces. Thank you to everyone that welcomed me. I was surprised to see that the vegetables were anything but tired looking. North Aston Organics had contributed some beautiful fresh herbs and there was an abundance of leafy green kale from the Cultivate Veg Van, as well as carrots, potatoes, parsnips and beetroot. I picked up a bunch of fresh coriander and some of the kale and pondered over what I could do for dinner. I had some leftover chicken curry in the freezer from the other week and an idea popped into my head for Saag aloo – but using kale instead of spinach. So there it became Kale Aloo with fresh coriander. Scrub and chop the potatoes into small pieces and then boil until soft. Fry the potatoes in a little olive oil with 2 cloves of crushed garlic and a small onion for 5 minutes. Add the cumin seeds, garam masala, chopped chilli and turmeric and fry for another 2 minutes until you smell the aroma of the spices. 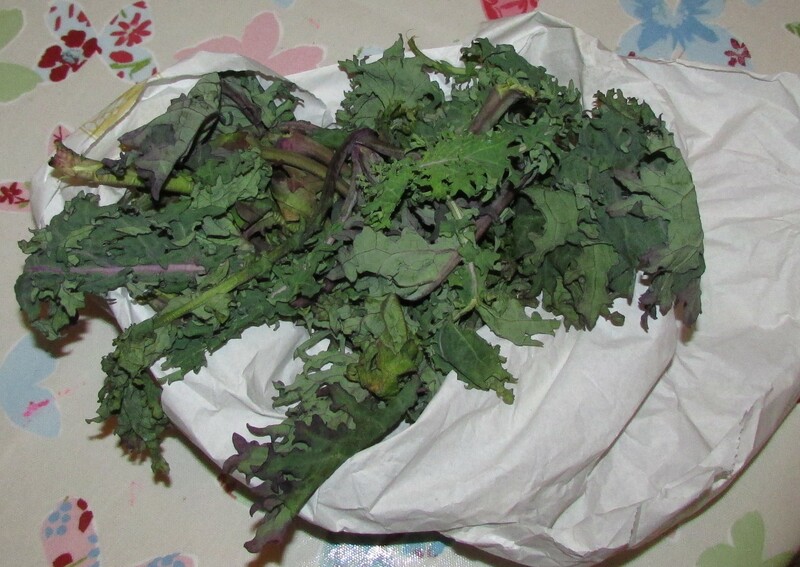 In the meantime, remove the very tough bits from the kale and slice finely before adding to the potatoes. Finally, add 1 cup of water, the tomato purée and creamed coconut. Season with salt and pepper and allow to cook for a further 10-15 minutes until everything has infused together. 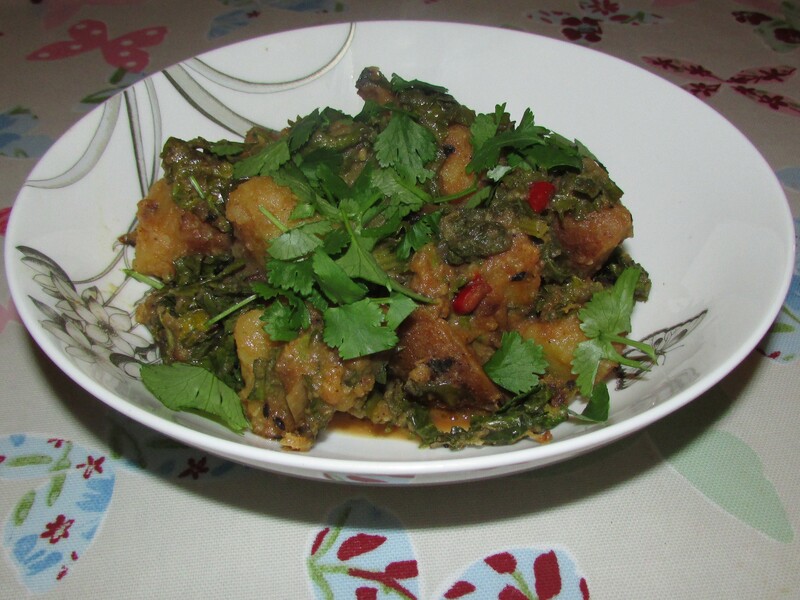 Sprinkle with fresh coriander and serve alone with rice or as an accompaniment to other curries. Simple yet delicious! It’s difficult to say how much this dish costs to make. But I would say you can buy all the vegetables for about £1 and the spices, tomato purée and creamed coconut come to about 50p. So £1.50 for 4 people. This entry was posted in Blog posts, Deals on local produce, Frugal Family Meals, Frugal family recipes on January 28, 2015 by carolinementzer.